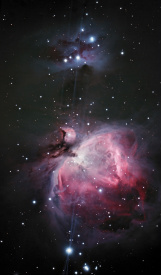 M42, re-processing of a picture taken in 2008/2009, using Neat Image. LLRGB picture with star spikes taken with Canon 20Da, ISO800/400 and WO FLT-110 without field flattener for FLT used. Total exposure time ~ 7 hours. Filter: 2" IDAS LPS. Guide via 16" LX200ACF and SBIG Camera ST-8XME. Picture taken during Dec-2008 and Jan-2009.